The brainy New Year’s resolution! In what Alzheimer’s Australia Vic is describing as the brainy New Year’s resolution Maree McCabe, CEO Alzheimer’s Australia Vic is encouraging Australians to take 5 simple steps to maximise their brain health in 2015. “These include looking after your heart, being physically active, challenging your brain, eating healthily and enjoying social activity. These lifestyle factors have a significant impact on a person’s risk of developing dementia and other chronic diseases,” Ms McCabe said. In what Alzheimer’s Australia is describing as the brainy New Year’s resolution Graeme Samuel, National President Alzheimer’s Australia is encouraging Australians to take 5 simple steps to maximise their brain health in 2015. “These include looking after your heart, being physically active, challenging your brain, eating healthily and enjoying social activity. All these behaviours not only have a significant impact on your risk of developing dementia, but also impact on other chronic diseases,” Mr Samuel said. 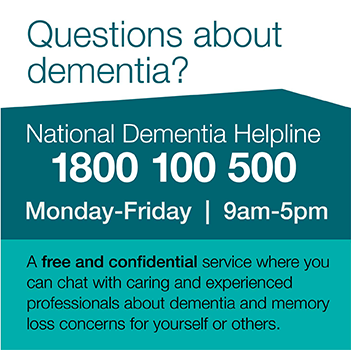 As the festive season approaches, Maree McCabe CEO Alzheimer’s Australia Vic is urging families, carers and friends of people with dementia to have a dementia-friendly festive season, where their loved ones with dementia are supported to be involved in the festivities. As the festive season approaches, Carol Bennett, CEO Alzheimer’s Australia is urging families, carers and friends of people with dementia to have a dementia-friendly festive season where their loved ones with dementia are supported to be involved in the festivities. Dementia Australia congratulates incoming Minister for Health, The Hon Sussan Ley and incoming Minister for Social Services, The Hon Scott Morrison on their ministerial appointments today. Alzheimer’s Australia has expressed reservations about the transition to the new Commonwealth Home Support Program (CHSP) arrangements announced today by the Assistant Minister for Social Services, Senator the Hon Mitch Fifield. Carol Bennett, CEO Alzheimer’s Australia said: “The new assessment process and review of support services, including counselling, information, education and advocacy, puts into question the continued funding for specialist programs that are vital to support the more than 332,000 Australians living with dementia." Alzheimer’s Australia has expressed concern that money previously committed to replace the Dementia and Severe Behaviours Supplement has not been included in the forward-estimates of the Governments MYEFO statements announced yesterday. The event will take place on Wednesday 3 December, hosted by the Melbourne Neuroscience Institute, University of Melbourne, the Florey Institute of Neuroscience and Mental Health and Dementia Australia. Dr Gillings was appointed as World Dementia Envoy by Prime Minister of the United Kingdom David Cameron, on behalf of the G8 group of nations in February 2014. Alzheimer's Australia (Tas) has released its Annual Report for the 2013-2014 financial year. In Jakarta, last night, Alzheimer’s Australia Vic’s Virtual Dementia Experience, based at the Perc Walkley Dementia Learning Centre, Parkville, was awarded the international 2014 Asia Pacific Information Communications and Technology Alliance (APICTA) Award for Education E-Learning. The world’s first use of serious games technology aiming to transform dementia care education, to improve the quality of life for people living with dementia, received the award at the ceremony to honour organisations and individuals in the Asia Pacific which are at the cutting edge of technology innovation. Are our programs and services meeting your needs? Alzheimer’s Australia is committed to ensuring we provide the very best service and support to people with dementia, their families and carers. From time to time we ask clients to tell us about their experience with our programs and services. Hall and Partners Open Mind have been commissioned by Alzheimer’s Australia to evaluate how well we are meeting your needs. The discussion paper, The Benefits of Physical Activity and Exercise for People Living with Dementia, by Alzheimer’s Australia NSW, has found that while people with dementia and their carers have reported several benefits of remaining physically active, it is often difficult to do so. Declining confidence in their abilities, inappropriately designed residential aged care facilities or risk averse cultures are some of the many barriers people with dementia face. The paper urges health and aged care providers and governments to act to ensure people with dementia are able to remain physically active as regular exercise and physical activity can help improve things like coordination, balance, functional ability, cognition and create a better sense of wellbeing. Dementia Australia NSW is pleased to announce the release of its Annual Report for 2013-14. The Report contains information about all the exciting activities undertaken during the year. The audited Financial Report for the 2013-14 financial year is also available. Alzheimer’s Australia Vic launched a Dementia and Diabetes Toolkit on World Diabetes Day to support the estimated one in five older Australians with diabetes who have an increased risk of developing cognitive impairment or dementia. Around 280 Australians are diagnosed with diabetes each day with population studies suggesting people with type 2 diabetes, on average, have double the risk of developing dementia compared with people who do not have the condition. Alzheimer’s Australia Vic today welcomed the announcement by the Victorian Liberal National Coalition pledging $13.5 million towards research, early intervention, support and awareness raising for Victorians living with dementia, their families and carers. “With around 78,000 Victorians currently living with dementia, it is essential that all governments commit to protecting the interests of people living with dementia,” Neil Samuel, Chair Alzheimer’s Australia Vic said. “It is of even more importance during the process of transformation of the aged care system and the roll out of the National Disability Insurance Scheme, which will occur over the next few years. By 2050, of the 135 million people with dementia worldwide, more than half (70 million) will live in the Asia Pacific region, a new report released today by Alzheimer’s Disease International has revealed. Alzheimer's Australia National President, Graeme Samuel AC, today spoke about the importance of good relationships between hospital staff, the person with dementia and their family carers in providing high quality care for people with dementia in hospital at the launch of two cognitive impairment resources by the Australian Commission on Safety and Quality in Health Care. After a nation-wide executive search and recruitment process, Ms Carol Bennett has accepted the position of Chief Executive Officer of Alzheimer’s Australia. She will commence her new role before Christmas 2014. The NRMA and Alzheimer’s Australia NSW have launched a new free guide to help people with dementia to understand the impact the condition has on driving and help prepare them for life without a driver’s licence.